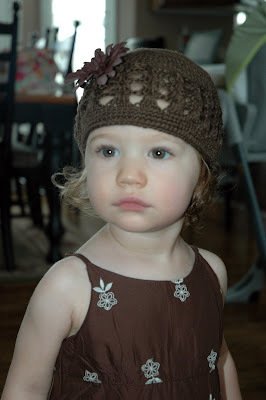 Since most of our readers don't get to see Ava on Sundays, we thought we'd share some pictures of her in her dresses. First up is a little dress she wore the Sunday before Independence Day. Ava is just like her mom in that she loves the 4th of July. Krista's favorite 4th of July activity is singing patriotic songs during church. Larry's favorite part is getting a day off from work. Ava's favorite part is the fireworks. This next dress Ava wore to the second annual 4th of July party at our house (our backyard is the best seat in town for the Lehi fireworks). As you can see, Ava was very happy on this day. She just couldn't get enough of playing in the sprinklers; and was also very excited about all of her family coming over to visit. She wasn't so happy on this day, but the she still looked cute in this red dress from Granny O.
Lastly, is this brown dress that Ava wore the second-to-last Sunday in July. It comes from a collection of Gap outfits that Krista had her heart set on from the moment she saw it. Always the thrifty shopper, Krista waited until the collection went on sale, at which point nothing was left in Ava's size. So, Krista enlisted the help of several family members in a search for Ava's size that covered several Gap stores both in Utah and Pennsylvania. The dress you see above and below was found by Krista's sister Lauren. Grandma Furr found a second dress from the same collection at a Gap in Pennsylvania. Ava wore it the last Sunday in July, however, we don't have any pictures of Ava in this dress as it turned out to be a very traumatic day. While we were exiting the chapel, Ava (who was trying to yank herself free of Larry's hand so that she could run wild) managed to dislocate her arm at the elbow. Sadly, it took awhile for us to realize what had happened. (We thought she was just crying because she was tired.) So we took her home and put her down for her afternoon nap. When she woke up, Larry walked into the room to find Ava lying perfectly still in her crib (never a good sign). She just looked up at Larry with tears streaming down her cheeks and said "uh oh". After examining her, we confirmed that her arm was hurt. We rushed her to an urgent care facility and the doctor popped Ava's arm back into place. Needless to say, we were all relieved to have Ava all put back together again. Those are all adorable dresses...and I must say she's very cute in them all!! I have to say I've really enjoyed getting a start on buying GIRL stuff!! It's gonna be fun!! Sad about her arm though...poor thing...glad it got "put back into place" though!!! that is pretty awful about her elbow! That Gap outfit with the hat is to die for! Sorry about her dislocated elbow. That would scare me to death if it happened to Joshua (even though I'm a nurse). No worries, I've had several parents bring their kids in with a similar story to yours.